Club Penguin Cheats by Mimo777 Club Penguin Cheats by Mimo777: Club Penguin EPF Report June 15th! Awesome! Club Penguin has cleaned up the HQ and they have more in store for EPF agents! Check it out! I Just Told You 5 Minutes Ago Int The Comments For The Last Post! Did You Notice The Room Being Tidier? Maybe we will unlock a new icon! I hope so! Probobly the new spy phone atachments like clotes catolog and all that and probobly a new mission. I think. Hey MImo i have a very simple theory (well it might be a bit long). well, I think they made the new EPf missions before making the Psa mission so thats why it took so long to make the mission. And the new tools for the spy phone might be revealed then! I already wrote it on the pin comments but here it is again if you didn't see it. Basically I need help trying to figure out how some people have Klytzy costumes from the game on Club Penguin.Please help Mimo. I think we will have to do another test.Like the one we had to do to join EPF. nah i think its the new tool in the phone because look, its that locating thing and thats the same icon on our phones so new tool coming out! Mimo when are you going to put the catalog cheats? Im ready! Im ready to report on June 15th to find the missing chicken wings that used to be on... THAT table! We shall find those stolen chicken wings and rescue them in time for dinner! Or we could just do what Club Penguin intends for us to do. That works too. Can't wait to see what lies ahead. He already did. Scroll down a bit to find them. Waddle On! That stinks. Did you try cleaning out your computer? That might work. Give it a try. Yea maybe. I hope this mission will reveal what Herbert is going to do now. Im curious. Waddle On! Yea me too. I hope this is a new mission. I hope a watering hose is one of the new spy phone attachments. Im going to need it for summer! Waddle On! That Klutzy costume is from the Treasure Book series 8 that came out about a month or two ago before the new game was released. To get it you need a series 8 code. Good luck! Waddle On! That'd be so cool! I can't believe Old CPG mod is alive! Good theory! I bet that is right! He put them, but they are way down a few posts. There are no new catalog cheats, though! Yeah! That's what we should do! What happened to the popcorn anyway? I would go with the chicken caper! That is a much bigger crime then.. *reads file* Herbert burning all of CP... We will find you chicken! Maybe a new mission involing herbert and the balloon he was in. I saw a penguin wearing an EPF Uniform! It was a Gray suit with a badge, and it had a blue thing on the shoulder. I didn't get to ask him where he got it. COOL!! that TOTALLY looks like a time traveling machine! AWESOME! I can't wait! i'm gonna, like, be down there in 2 seconds. true story. I saw that too! COOL! ~~~~~~~~~~~~~~~~~~~~~~~~~~~~~~~~~~~he did scroll down hes to quick man! ~~~~~~~~~~~~~~~~~~~~~~~~~~~~~~~~~~~we must get the chicken legs befor they go stale and return them to kfc to eat dinner! ~~~~~~~~~~~~~~~~~~~~~~~~~~~~~~~~~~~oh man im saying /said that in a modded coment! ~~~~~~~~~~~~~~~~~~~~~~~~~~~~~~~~~~~yes it is a icon its feild ops! Well, i think the sign that says Report For Duty on June 15, might be the releasing of the BATTLE ARENA! Because it has the symbol thats coming soon on the screen. -Cordy5 (Max). Nope, I keep hearing that but it don't work for me. Tried a few times. Waddle On! I ate it! Lol. Waddle On! He unlocked it from the new DS game Herbert's Revenge. If you get the game it will come with a code inside used to unlock the suit and Flare the elite puffle. Waddle On! I think the second picture is pictures of the HQ for each one of those years on top. *gasps* Mimo777! I had found something! Follow these steps. 1. Log on to Club Penguin. 2. Go to the Ski village. 3. Go to the ski Lodge. Do you see a mirror? There is a shadow! Do you think this is a clue to a new ninja? Water Ninja? 2010 one might be an upcoming and new HQ. That wasn't a Klutzy costume, just a normal crab costume. Also, the suspected 'Herbert' costume is in fact a yeti costume from before. Um...Mimo777 I dont think that your idea is correct? In the top it says stuff like : HQ 2007. Its like Head quarters in The year 2007. Just to tell you something Slippeesarts, you write a lot of comments! That is an exellent theory! I recon we could be able to switch between the HQs that have been invented, or at least look at the blueprints! did you know that if you through a snowball in the Box Dimension the snowball will bounce! It is in the new Treasure Book. Go to the toys, click on the treasure book and you will find it. But you need codes from the toys to get it. Now I just need to find out how to get that EPF uniform I saw. Look you can choose you HQ you want. 2005, 2007, or the new one 201o! i think its a time travelling gadget! 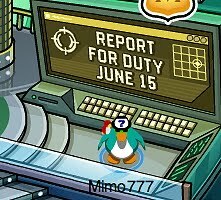 On the top left of the screen where it says report June 15th it has the same icon the new EPF phone has. Good idea could happen or it could be the new era of a mission we will just have to wait and see thanks for commenting. Maybye we'll be able to time travel in the future and stop the Hq from being flooded with popcorn! Good idea! Try clearing your cache! That's what CP says to do! Herbert's intentions haven't been so clear... I hope it will tell us what he is doing! Too late! My plants are already long gone. Lol. Yea! You can also get some other really cool items from it! I think that IS what's going to happen! Then we could go back to the broom closet! I have that too! You just need the game Herbert's Revenge! I think it is! Can't wait. Yeah, I think she needs to clear her cache! HEy Mimo. Cool Post. Just wanted to share with you my theory. You Say you might think there is going to be a new mission on June 15, right? And maybe thats why it took so long for the Veggie Villian to come out cause maybe they were working on two Missions and not only one. Yeah! That's because it's all EPF... Elite Popcorn Force! I do too! It's gonna be cool! Yep! I like the first one! Back in '05! Yeah, I can't wait! I am excited! Yes we did! I think of it as more of a wave or a slide. Lol! Were gonna get the next two gadgets! Plus the new DS game and keeping up with partys and stage plays and catalogs and the new EPF room and Everyday Phoning Facility and all that stuff. Yea thats probably why. I can't wait to see whats going on June 15, what about you? UPDATE. I got it. Thanks for the help. Waddle On! I hope so. Then I can go back in time and get the Beta Hat! HA! Take that clock that only moves forward!!! Waddle On! You get the new EPF uniform from the code that comes with the game Herbert's Revenge. You can also get the Klutzy costume from Herbert's Revenge too. Waddle On! Yea thats cool. It's just like your in the Box Dimension. I shall catch your snowball! What?? It just bounced right over my head!! Lol, Waddle On! Cool. Happy early birthday. My birthday was the 25th, the day the new DS game came out. Lol. That ninja shadow has been ther for years but good find. Try to find more. I think we will be able to see the old HQ! Or we get a new logo! I think after Water Party theres a new game called Card-Jitsu Water! Hey mimo would'nt it be cool if club penguin had one day like when they started cp? Like they had the old map and the OLD psa with 1 tv remember? and the iron door. And they only had blue green pink and black puffles. That would not be so good in my opinion. That would mean since Herbert didn't blow up the old HQ, there wasn't any need to build another one. I don't hope that happens, maybe we can just stop in general Hebert in the first mission that was ever made, like we could trap him and turn him good! i would like to say that fragger is now in the app store just though u would like to know that mimo Waddle On! Maybe we'll get new updates for our phones once we're done the mission, and the actual mission will be getting the gadgets from Herbert. everyone hurry!!! i have a code for treasure book and am giving it away....here it is!!!...........b698pbmzb.......GO!!!! first one too see wins!!!! yay!!! i never saw the first hq because i started in 2007 so im soooooo glad i get to see it!!! MIMO!! THERE IS A NEW MISSION IN THE EPF CALLED "VEGGIE VILLAIN"...I NEED HELP ON CROSSING THE RIVER IN THE CORN FOREST!!! HELP!!! Mimo has already posted the mission if you need help go on the smart cheat guide. It should be on the right of this site. If it isn't look for his post about it in the archives, there should be a link in the post. That has been there for ages. There are more hidden things though! 1: Flipperprints on top of the pet shop. 2: A invisible ninja in the lighthouse. 3: A ninja shadow in the window in the lodge attic! Please dont use caps, your hurting my ears! That mission has been there since may 17th, mimo posted a walkthrough. Look in the sidebar. hi mimo its me again! i commented saying ...OMG MIMO CAN I TELL YOU SOMETHING I TOLD CLUB PENGUIN TO DO THAT!!!! I SAID WOULDNT IT BE COOL IF GARY WAS MAKING A TIME MACHINE AND SOMETHING WENT WRONG AND WE ALL WENT BACK IN TIME TO 2005 BEFORE DISNEY OWNED CLUB PENGUIN? AND THEY EMAILED yes it would be cool but to be sad if we dont make your ideas they may come true though!! I ALSO EMAILED THEM 2 MONTHS AGO ...... wouldnt it be cool if we could recycle our messages?? I also emailed them before the hq explosion saying...... Why dont we make epf missions because no one is ever in the room I think we should also fix it up so that more penguins could go in!! AND THEY DID THEM ALL!!!!!!! IM SO HAPPY!!! p.s mimo sorry for hurting ur ears p.s.s I REALLY SAID THIS IM NOT LIEING!! -MRSMURRELL and I found something out all by myself ... here it is!! today I uploaded six hundred to five hundred coins to my online club penguin account and when I logged on to club penguin ( I did this around 9 am and logged on at 10 or 11 ) I was changing my clothes and saw some clothes I didnt remember unlocking ( I have alot of club penguin toys so i got alot of items unlocked ) I saw all the items you unlock in the game after finishing the missions!!! it was so cool you get a flash light the crab outfit a flash light and some other thing you unlock it was so cool!!!! oh ya p.s if you go to the under ground cave did you notice you can still get the hard hat there??? 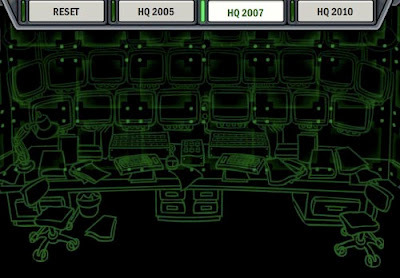 I went to the EPF command room on 15th and there isnt a thing for us!